Flours & Fibers: I'm a knitting instructor! Today was an important day in my knitting life. I taught my first class, and it was even better than I hoped it would be. I took a couple of hours off of work today, so I could be completely prepared for class. 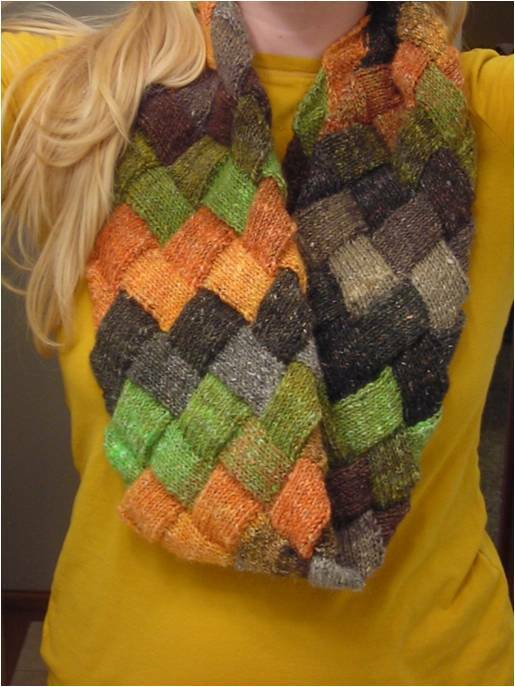 I had high hopes of presenting the class with a great tutorial to go along with Allison LoCicero's awesome Entrelac Scarf pattern. They got the pattern alright, but after two hours of hard work, I was only able to produce one tutorial. I won't get into the whole story but it involves two printers, two laptops, one outdated operating system, one jump drive, and the blue screen of death. It's a miracle that I got one printed. The entire class will be getting the tutorial by email later tonight. The class was held at the 365 Days on a Farm Yarn Shoppe in Eldridge and the topic of the day was the technique of "Entrelac". I had been intrigued by it since I saw Miss Effie's beautiful scarf when we were at the Crafting at the Convent Retreat. 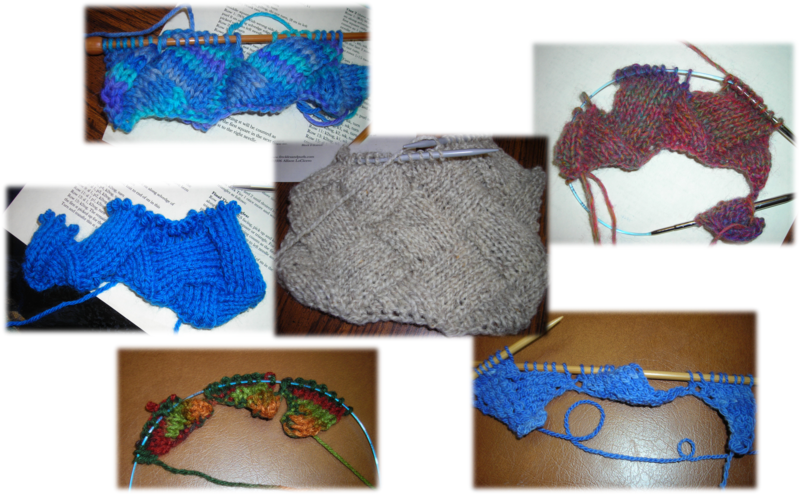 I started out with Dorrie's Cowl. 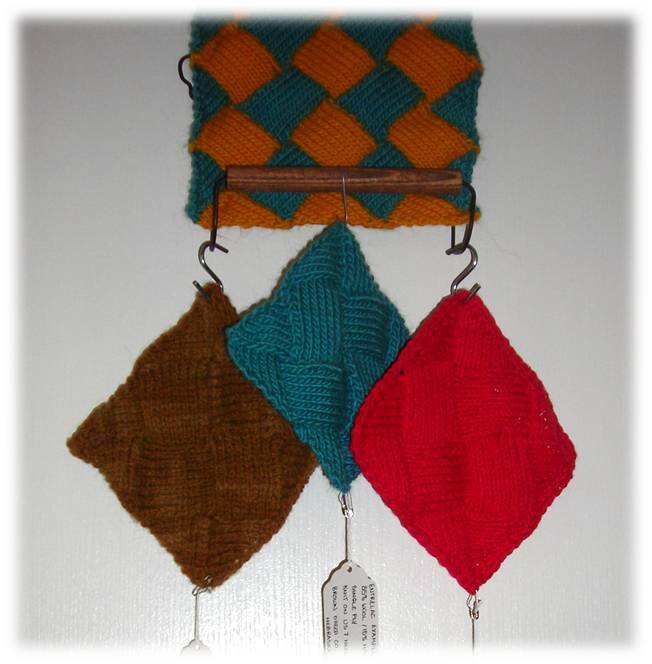 Then Tami of the 365 Days on a Farm Yarn Shop talked to me about teaching a class, and I went crazy knitting samples. So today, I breathlessly arrived at the shop a few minutes late, hoping that myearlier technical difficulties were not indicative of the rest of the evening. I was pleasantly surprised to see nine (!) women there eager to learn the technique of entrelac. The technique is not easy, and at first, it's definitely confusing. I was really proud of all of my students. Some of their work is below! I really enjoyed this class and all of the women who participated. 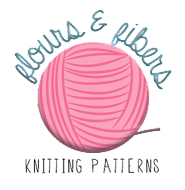 I love sharing my passion for this craft, and one of my favorite things is the fellowship that comes along with spending time with other knitters. So thank you, Sue, Brenda, Heather, Sue, Shelley, Ann Marie, Maggie, Pam, and Janalee. As you can see, a couple of hours is not enough time to finish a project like this. So I'll be back at the shop on Thursday, June 23, at 5 pm for additional help. All are welcome to stop by and join in the fun! Way to go, Laura! I bet you did a wonderful job!